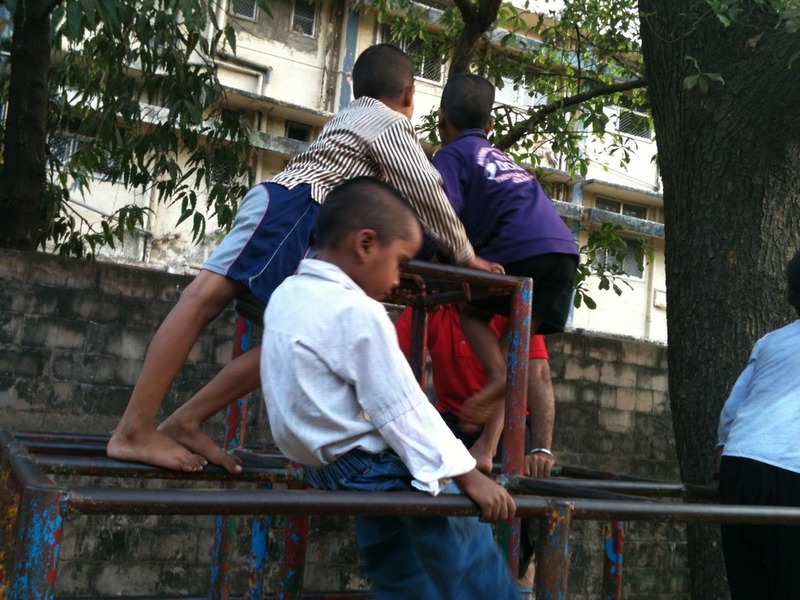 I intend to write a series of these blog posts about the Parks and Public spaces in Mumbai that we have visited. After K’s arrival, every weekend has rather became an expedition to find some patch of green. I would be rating these places on a scale. If my motivation still prevailed then I intend to write letters to the local municipal office to take suitable actions to make it better. Well lets see how this goes and we’ll figure it out in future. 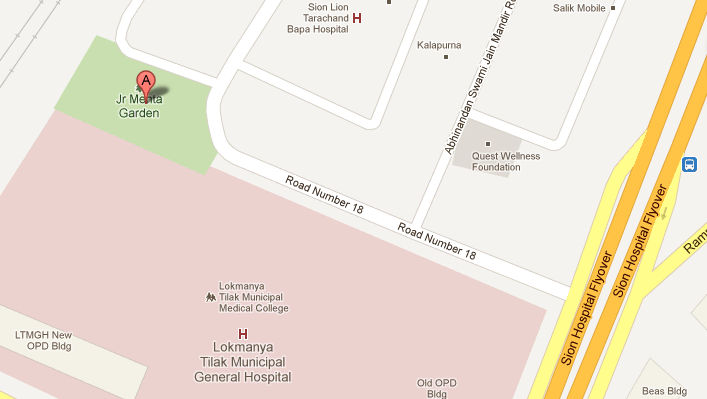 This week I want to write about the J.R.Mehta Udyan near Jain Society, Sion West. Its very easy to get to this park just look at the map. As soon as you enter this garden the first thing you notice is how badly the garden is planned. Near the entrance there is a big office, I can understand a ticket counter or a rest area for the caretaker but what is this big office doing in a public space? 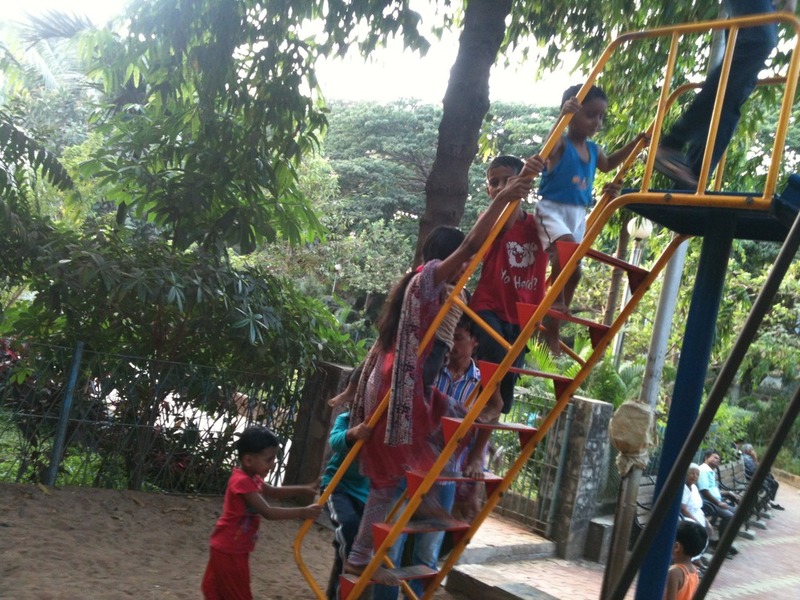 Further going in there is the play area which is perennially overcrowded with children. The shortage of enough play equipments is glaringly obvious. In this photo the swing probably is designed for 4 children but has 7 already while the 8th is being plonked. 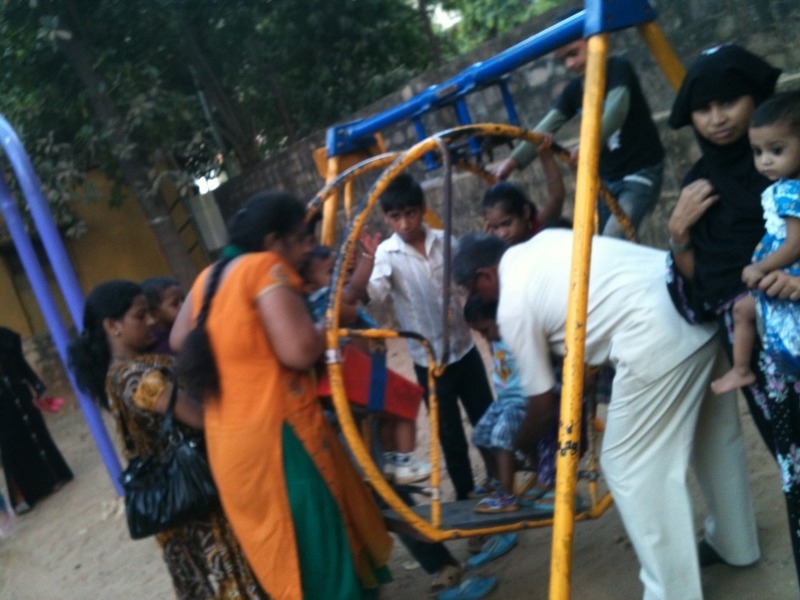 This is common to see in this park, where parents stand in a queue or edge themselves in to get their kids on slides or swings. Opposite this play area is an open space which has a central island, some kind of landscaping feature, which looks to me like a waste of space. There is hardly any grass in these areas. The center of the park has a mammoth like water fountain, which I have seen working only couple of times. Towards the end of this garden there is a shed like structure which consumes a lot of space. What goes on here? There is a large TV screen which runs some religious/spiritual stuff. What is it doing there, is a very good question. The garden has very good trees at the boundaries. The thing that needs to be done is get more green open areas for children to play. I suggest to remove the water fountain and create another play area with slides, swings, etc. This will also save on maintaining the fountain which hardly works thru the year. Also water which can be used to water the landscape and get more “green” areas. Remove the large screen from the shed and create an area for people to do yoga or excercise. Make a jogging track along the periphery. This place as such is not aged/handicapped friendly. I suggest creating sloped ramp at the entrance and where ever necessary. This will also help mothers walking their babies in strollers to maneuver the barricade that is currently present. This park is fairly good. If the locked space is released then it would provide lots of open areas for play. Just posting a few more impressions to invite more ideas and comments. An entertainment zone with rides for kids and a balloon and toys vendor welcome you at the entrance. This is a major attraction for moms and kids. Also, there is a ‘drinking water’ porch to the left of the entrance. The entrance is narrow and it’s a challenge to push in a pram/stroller. Eatables are strictly not allowed! In my college days, while we ‘d be group studying at a friend’s balcony that overlook’s the park, we ‘d be woken up by the hilarious laughter from the ‘laughing club’ memebers. Also, I have heard that every morning, a juice vendor selling herbal concoctions makes good business right outside the garden. To use space candidly is the biggest challenge of a Mumbaikar today. Let’s join in!